In the incident, which happened in Singapore, the guard suffered multiple injuries. According to a report in the Straits Times, which quoted the victim identified as 60-year-old Andrew Lim, the incident started after the man approached a security guard complaining that he was trying to leave the building but was unable to find an exit. The security guard claims that he tried to explain that the main exit of the building has been locked as it was late. However, the man refused to listen. When the guard tried to inform the man that there were other exits, he ignored him and began behaving in a "threatening manner", reported the Straits Times. In the video, while the guard asks the man, "Can we talk nicely? ", to which the man replies with a cuss word, saying: "F**k off." Still, the guard offers to show the man the exit, but he intentionally spreads out his arm to block the guard's path. "You walked into my arm!" the man says, with a mocking laugh. As the security guard tries to assist the man, who was also recording, to direct him out of the carpark, he keeps dismissing him by laughing repeatedly and ccalling the guard "an idiot"
The man is then seen walking towards another part of the carpark with the guard. However, at the corner, the man sticks out his leg, tripping the guard. He then punches the 60-year-old guard, causing his spectacles to fly off his face. After physically assaulting the guard, the man tries to hit his colleague, who was filming the incident on his phone. He then fled as the other guard called the police. The security guard, Andrew Lim, who was injured after being assaulted, is currently on medical leave. Regal Security had sent him for an X-ray examination, following which he was told that he had to go for a CT scan as an abnormality has been detected. K Bhaskaran revealed that the firm will be taking care of Lim's medical and legal costs. 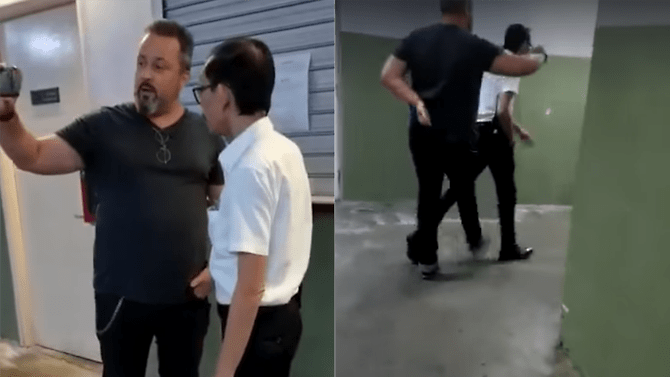 The general manager, while speaking to Channel NewsAsia (CNA), said the security guard was a "very polite and capable guy", and described the man as "bully". "I would say he's a bully. Such a huge-sized guy tackling a 60-year-old man half the size of him, that is why I'm taking this very personal(ly)," he said, as reported by CNA. Channel NewsAsia reported that the police are currently investigating a case, which has been classified as voluntarily causing hurt. Assisting the police in their investigation is the guard and another 47-year-old man. "Stealing is not wrong, only when you are arrested it becomes wrong." Najib Asks If He's A Thief, Why Would He "Leave RM174 Billion" In Petronas' Cash Reserves? He was defending himself from allegations that he stole money when he was in power.